We are pleased to offer the 1899 Society, an exclusive giving society for collegiate members donating $18.99 or more within a calendar year (January 1 to December 31) to the Alpha Sigma Tau Foundation. Making your gift online now. Participating in Alpha Sigma Tau’s annual Founders Day of Giving celebration held in November. Seeing a Foundation representative at any national event. The Alpha Sigma Tau Foundation is pleased to recognize the following collegians as members of the 1899 Society for calendar year 2018. Collegiate giving is integral to the success of our organization, and your generosity is truly appreciated. Thank you! 1899 Society participants in 2019 are recognized with the exclusive yellow anchor dangle. Please Note: This list is considered “rolling” until the end of the calendar year and will be updated on a regular basis. Be the first from your chapter to join! 1899 Society participants in 2018 are recognized with the exclusive purple anchor dangle. The Alpha Sigma Tau Foundation is pleased to recognize the following collegians as members of the 1899 Society for calendar year 2017. Collegiate giving is integral to the success of our organization, and your generosity is truly appreciated. Thank you! 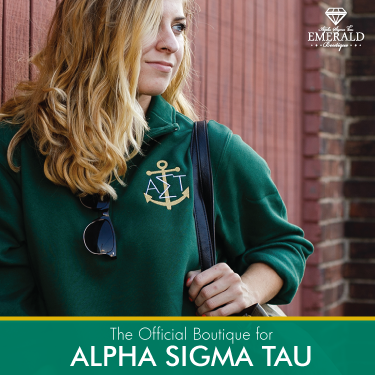 Individuals who participated in the 1899 Society in 2017 were recognized with the exclusive green anchor dangle.